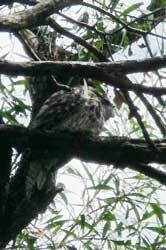 The Melrose Park Bushcare Group was established in March 1999. The group works in Melrose Park, Wooloowin, only six kilometres from the GPO, in the northern suburbs of Brisbane. (See UBD Map 140, ref. 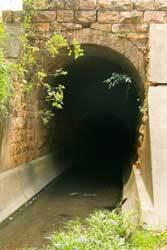 F6) Melrose Creek first emerges from an underground stormwater drain from under Rose Street into Melrose Park. It carries urban drainage from parts of the localities of Lutwyche, Wooloowin, Kalinga , Eagle Junction and Clayfield. It eventually discharges into Kedron Brook near the east end of Kalinga Park. Melrose Park is roughly in the shape of a large rectangle bounded on three sides by Rose, Roseleigh and Thorpe Streets. 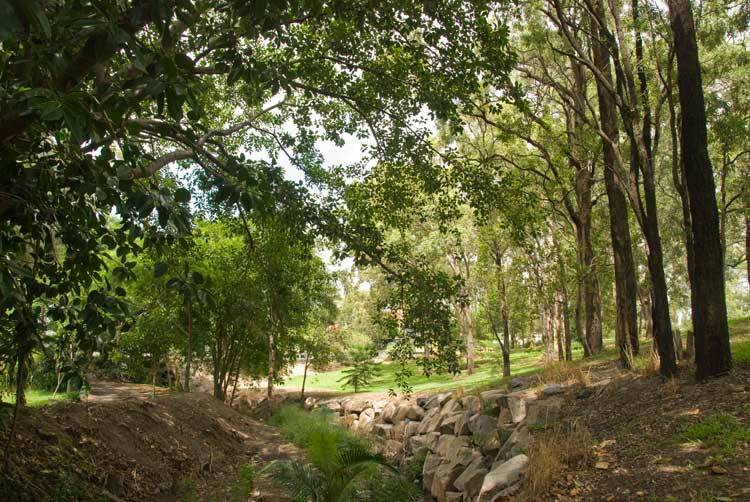 A small portion of associated parkland is located where Melrose Creek runs under Dawson Street close to Frances Avenue, a short road that also provides eastern access to the park. Amenities in Melrose Park include; a children’s playground and teenagers' play area, a sculpture walk, toilets, two cricket playing fields, a cricket practice net and the bowls club. The park is well used by locals. 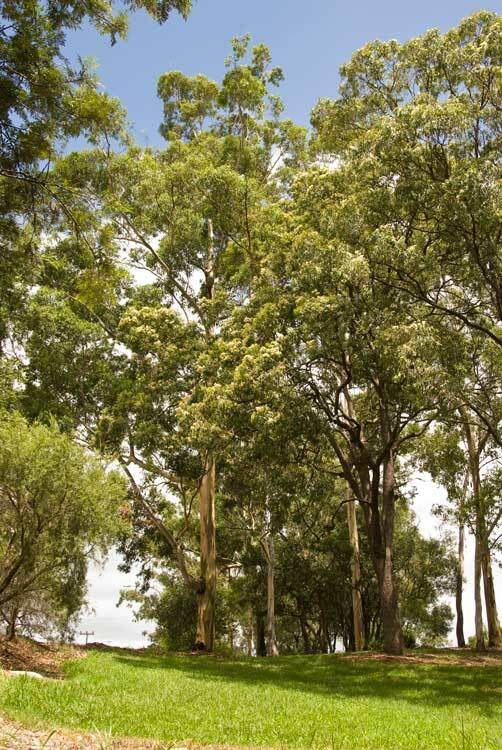 In this large park, there is a stand of beautiful old eucalypts and a stately row of tall palms. Looking through the palms you can see many grand old Queenslander homes. Cheese Trees (Glochidion ferdinandi), are a feature along the creek. Birds feed on the fruit and disperse seeds. Cheese Trees are a local native plant, common along many Brisbane creeks. 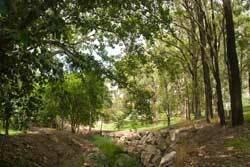 Brisbane City Council consolidated the creek banks with minor realignments and boulder wall support. Fortunately, weed growth through these boulders has not been a significant problem. 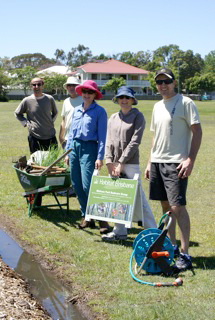 Melrose Creek Bushcare Group has enjoyed strong neighborhood support. Numbers may be small at a planting activity unless there has been a special campaign in conjunction with BCC support. In fact, the compact nature of the parkland means that a small group can generally handle the overall tasks in suitably sized 'bits'. 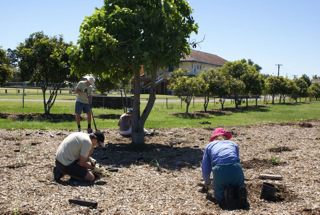 Each new revegetation activity is usually started by preparation of a small area of heavy mulch. This is then followed by the hole-digging and planting with carefully selected plants that combine tall trees with a suitable understory of native shrubs. The images immediately below (and of the Eastern Water Dragon above) were taken by John and Carolyn Lister at a small planting activity on October 2010. This is an example of a typical group activity. The group selected a new area called the 'Flame Tree site' due to the one mature but stunted Flame Tree growing in the middle of the site. They added one Cheese Tree (Glochidion Ferdinandi), a White Holly (Pittosporum rhombifolium) and a Crows Ash (Flindersia australis). Also planted were several Banksia spinulosa species, Callistemon viminalis species, Lomandra muliflora and Dianella species. It was noted that the Banksia and Callistemon planted at their Bowls Club site have done so well it was felt that more of the same good performers were best. An early start ensured that the heaviest work could be completed before the heat of the day made conditions unpleasant. They followed this working bee up with another, a month later, to plant more Dianella species at this site. All work and no play makes for an unhappy combination. That's why the group always seeks to make everyone welcome and to 'work together but at your own pace' in a sociable atmosphere. Usually, there is a friendly mid-morning tea break arranged at a neighbor's home (as in the picture, above right). This helps to bond the group's community spirit. 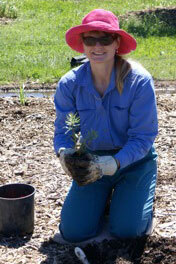 Since the group started in 1999, there has been a steady progress with the establishment of native planting. Their Dawson Street site has many mature trees and shrubs now and it is looking great, given all the rain over the end of 2010 until recent times. 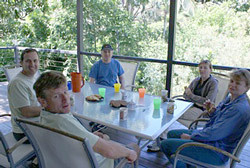 Regular support from the Brisbane City Council staff of Habitat Brisbane has been vital in the Group's success. The supply of plentiful mulching materials and suitable plants has greatly assisted this relatively small group. On 21 January, 2011, as leaders of Melrose Creek Bushcare Group, John and Carolyn Lister received an Australia Day Achievement Award from Brisbane's Lord Mayor Campbell Newman. This was for their contribution to the community by their bush care work in their local area. Link to the next page that shows images of their beginnings and the progress since then.